Curious Chef is all about stirring the creative and curious side of children. Under the guidance of adults, budding chefs proudly take their first steps towards a lifelong love of cooking. With each uniquely designed kitchen tool, discovery and fun is just around the corner. Children love to help out in the kitchen where they quickly learn valuable life skills and can savor the feeling of accomplishment. To enable their success in the kitchen, Curious Chef has designed a full line of kitchen tools and gadgets with the small hand in mind. Designed specifically for your kitchen helpers Curious Chef has created a user friendly and functional line designed especially for your child. 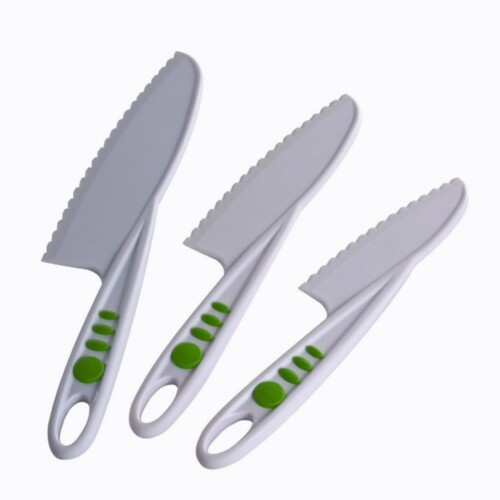 One of each of the small, medium and large nylon knives will let your kids safely slice, dice, chop, and cut right next you. The knives have serrated cutting edges to ensure clean cuts and blunted tips for your child's safety.